The Chief Economist of the World Bank speaks to TGD about his latest book "Demystifying the Chinese Economy". He explains the dynamics behind the phenomenal growth of the last 30 years and some of the unique challenges that China faced during the transitional reform period. Justin Yifu Lin is the Chief Economist and Senior Vice President of the World Bank, a position he has held since June 2008. Prior to joining the Bank, Mr. Lin served for 15 years as Founding Director and Professor of the China Centre for Economic Research (CCER) at Peking University. 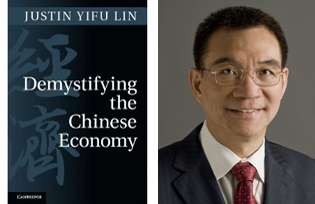 Mr. Lin received his PhD in economics from the University of Chicago in 1986 and is the author of 18 books, including The China Miracle: Development Strategy and Economic Reform and Economic Development and Transition: Thought, Strategy, and Viability. He has published more than 100 articles in refereed international journals and collected volumes on history, development, and transition. In 2007, he gave the Marshall Lectures at Cambridge; and in 2011, the Simon Kuznets Lecture at Yale and the UNU Wider Annual Lecture in Mozambique, the first ever to be held in a developing country. Justin Yifu Lin was a deputy of China’s People’s Congress, Vice Chairman of Committee for Economic Affairs of Chinese People’s Political Consultation Conference and Vice Chairman of the All-China Federation of Industry and Commerce. Can you tell me a little about the background to the book? It is based on lectures you gave, is that right? 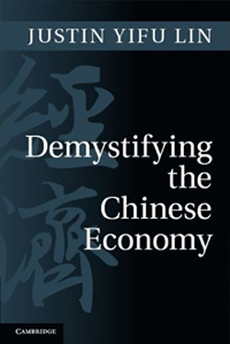 Yes, the book is based on my lecture notes for a Chinese economy course that I taught at Peking University for 15 years before joining the World Bank. The lectures were initially in Chinese, but were translated into English and the statistics were updated to make them more relevant for today. You begin your book not by looking at recent history, but by looking back almost 2,000 years into China’s past. During most of this time China maintained global economic dominance, with only a 150 year gap in performance caused by the Industrial Revolution. Yes. There are two reasons why I chose to start my analysis when I did: first, to understand the mechanisms of economic development. Historically, technological innovation relied on workers’ experiences in the production process. Innovation was not systematic and happened very slowly in pre-modern times. After the 18th century, however, innovation progressed much more rapidly as the innovation process began to rely more and more on structured experiments performed by scientists in laboratories. In pre-modern times, China was very successful in innovating due to its large population, which provided a wider base of workers from which new tools, methods, and ideas could be generated. China quickly started to lag behind in modern times due to its failure to shift towards innovation. Second, I wanted to take this long historic view to emphasize the formidable journey that China undertook to reach its current levels of prosperity, growth, and income. I also took a long view because I wanted to explain the political and economic background that has been developing over centuries so that Chinese intellectuals and thinkers can better grasp how best to make a contribution to their country and its development. In your book you make it clear that China has been a leader in essentially inventing “developing country” economics through trial and error. Has China invented a new branch of economics? I would not say that China has invented a new form of economics. China was not the first country to use the export-oriented approach to development. Japan, for example, also went down this road. Neither was China the first to adopt the pragmatic and gradual dual-track approach to economic reform. Mauritius had already adopted a similar approach in the early 1970s. China has attracted a great deal more attention due to its size. China has proved to be a leader in terms of defining what the correct role of government is in the development and transition process and what the correct level of intervention should be. The Chinese government has been very successful in pursuing its dual-track policies, especially given the national context: it maintained a 10 percent growth rate for thirty years while at the same time managing a population of 1.3 billion people. The major success story coming out of China seems above all to be poverty reduction. The figures you quote are remarkable: in 1978 there were 250 million people in poverty compared to 36 million in 2009. Yes, but those figures relate to the definition of poverty used by the Chinese government. If you use the internationally accepted standard of poverty as those people living on less than US$1.25 per day, the number of people getting out of poverty is 600 million. You dedicate a large part of the book to explaining China’s efforts to develop heavy industry despite the inherent difficulties of large capital expenditure and currency accumulation. Why is this issue so important? Yes, it is an important part of my book because all of the socialist countries under the Stalinist model wanted to develop heavy industry, but I have to say that this was not unique to socialist countries. There was a general trend among many countries in the post-WWII period to develop heavy industry and to modernise their industrial base. While the intention to modernise through the expansion of heavy industry was good, the problem was that most countries did not have a comparative advantage in this sector. These industries were only able to survive due to government protection and subsidies, as well as various other kinds of distortionary policies. These distortions resulted in “rent-taking” and extensive corruption. While many countries did build up a modern industry, overall economic performance was very poor. This is one of the key problems for low-income, agrarian economies that are trying to modernise by developing heavy industry from scratch. You pinpoint technology as the key to achieving a robust economy in the future. Why is technology so important? If a country wants to develop and improve income levels, it has to improve its productivity levels. The only real way of doing this is through technological innovation, which continuously improves productivity levels over time. For that reason, technology—or more accurately continuous technological innovation—is the key to sustaining economic progress and development. But for developing countries, it is crucial for them to have the correct technology policy that develops industries along the line of comparative advantage so that they can tap into the potential advantage of backwardness to accelerate their growth. You mention that China got itself into a mess by keeping its state owned enterprises (SOEs) afloat for so many years. This led to damaging distortions in the Chinese economy, especially relating to the low interest rate that had to be imposed. Is this problem nearing resolution? When China’s economic reforms and opening began in 1979, the government provided significant protection and subsidies to SOEs. The key reason was to avoid the collapse of the non-viable SOEs, which would have caused a sudden spike in unemployment and contributed to social instability during the transition period. While the problem has not been completely eradicated, it has been radically reduced. But, with thirty years of rapid economic growth, capital has accumulated and become more available, and the economy has expanded, creating jobs. The majority of the SOEs are now competitive and can survive without government subsidies or protection. In my opinion, the government can now afford to let the few non-viable SOEs go bankrupt because new, competitive industries have emerged and created many job opportunities. The Communist Party has showed great flexibility in adapting to change and switching policies when they turned out to be wrong. It seems odd that such a massive political party could be so flexible. It is important to understand the motivation behind China’s political and social transition. The goal is to modernise the nation and improve the well-being of the 1.3 billion people. This is an incredibly difficult thing to do in such a large country, thus a gradual, pragmatic approach was really the only way forward. The pragmatic approach is by definition flexible. You refer frequently to China’s endowment structure as a key element of its success. A country’s endowment structure is made up of its labour force, natural resources, and capital. These are the basic ingredients of production. The relative abundance of these three factors is different in every country, and the balance amongst the three will determine the nature of the economy and its means of production. For an agrarian economy, for example, the endowment structure will be rich in natural resources (such as land and minerals) and have a large labour force, but it will be poor in capital. With the accumulation of capital and skills, the balance of the endowment structure changes. This is certainly the case in China, where initially its vast natural resources, abundant cheap labour, yet scarcity of capital, led its economy to be agrarian-based. Over time, however, the labour force is becoming more expensive and skills and capital are being accumulated. As the economy develops, this structure will mutate. China’s “dual-track” reform policy was initially ridiculed by nearly everyone, but it has turned out to be a great success. Why has it been so successful? The main reason for the success of China’s dual-track approach is that it provided stability by offering protection to sectors that were not initially viable, while at the same it allowed firms to enter into new sectors that were consistent with China’s comparative advantages. This has helped China maintain stability while also achieving competitiveness and dynamic growth. China resisted the Washington Consensus and the “shock therapy” that was so detrimental to the Russian economy. It looks like this was a very wise move, do you agree? Not only Russia but also other countries that followed the Washington Consensus experienced a terrible economic shock followed by a lengthy stagnation. I think that the Chinese experience proves that the dual-track approach is a better option. The Chinese banking system suffered during the reform periods as it was saddled with a very high percentage of non-performing loans as a result of being an instrument of government policy. Has this situation changed now? The situation has greatly improved. As I mention in my book, in the late 1990s, about 40 percent of loans in Chinese banks were non-performing loans, but the situation has undergone a radical improvement, and that figure is now less than 3 percent. The reason for the change is that the SOEs that were once non-viable have improved their fundamentals and are no longer in need of so much support from the banks. They are re-paying their loans in a regular fashion. The Chinese banking system is now looking healthy, especially relative to other countries in crisis. How do you reply to those analysts who still insist that the Chinese economy is nothing but a house of cards and that the government’s economic data is still not completely reliable? China is a transition economy, so clearly there will be areas for improvement, but to anyone who still harbours doubts, I recommend that they pay a visit to China, so they can see the economic performance first hand. Per capita income since 1979 has grown dramatically. In fact, even as recently as 1980 China was still a low-income country with its per capita income (measured in purchasing power parity) only 30 percent of the level of the average Sub-Saharan African country. Today, its income per capita of $7,500 (in purchasing power parity; $4,400 in current dollars) is over three times the level of the Sub-Saharan Africa average, and China is well established as a middle-income country. For those who doubt China’s achievement in the last thirty years, I would recommend that they visit a struggling and impoverished Sub-Saharan African state, followed by a visit to China and note the difference. That is where China started thirty years ago – and that is how far China has come. Seeing is believing! You mention that the Chinese stock market is still in its infancy due to the fact that most companies do not pay dividends, meaning that owning a share is a bit like owning a gambling chip—you are obliged to merely speculate on price movements. Is this problem being resolved? Speculation on the stock market cannot be avoided, although there has been significant improvement, much like in the banking sector. The real change has been that, in the past, many of the companies listed on the Chinese exchange were not viable, but they have now become competitive and profitable. You suggest that the global imbalances that led to the recent recession were caused by, amongst other things, the dollar’s status as a global reserve currency. This is a situation you would like to see changed, is that true? This is not a situation that can be changed quickly, simply because there is currently no alternative to the dollar. In the coming decades, the Chinese economy is likely to continue its dynamic growth and increase its importance in global trade. One possible scenario is for the Chinese yuan to become a constituent of the IMF’s Special Drawing Rights (SDRs). Eventually the yuan may become a reserve currency too, but at the present there is no substitute for the dollar, not even the euro.